After waiting outside for nearly an hour, the guests, permitted to carry only a car key and driver’s license, were buzzed in four at a time. They removed watches and bracelets, walked through a metal detector, passed through the searching rooms and came into the visitors’ room of the Homestead Correctional Center. The occasion: ArtSpring’s graduation presentation of A Midsummer Night’s Dream. With just paper and paint, and whatever found objects the inmates could scrounge up, this gray, dismal space had been turned into Ancient Athens and a nearby forest. Wearing costumes fashioned out of paper and disposable table cloths, women incarcerated for crimes ranging from drug possession to embezzlement to murder became the very believable Duke of Athens, Bottom, Puck, and other characters of Shakespeare’s well-known comedy. 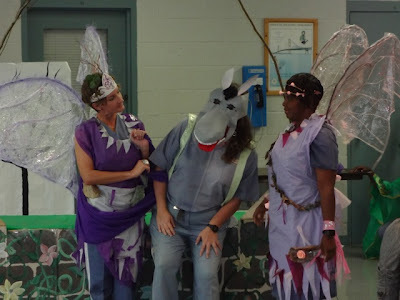 Just as this play transformed prison inmates into Shakespearean characters, so the ArtSpring program transforms hardened, defensive offenders into caring, feeling members of a community. ArtSpring in action. Photo submitted and used by permission of ArtSpring. 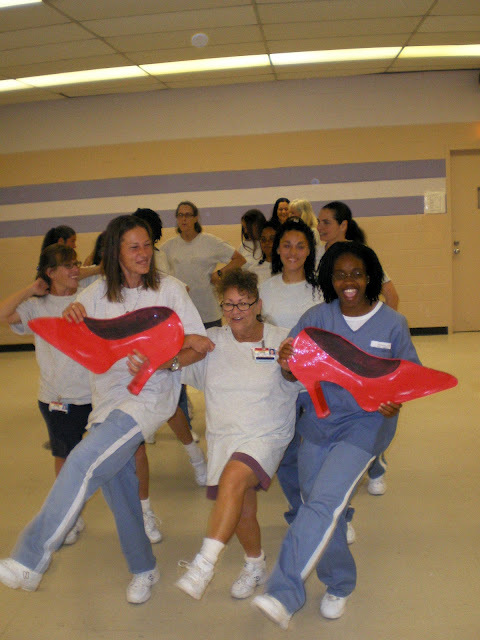 The principal vehicle is the ArtSpring Inside Out program, a three to four month program for women offenders that incorporates dance, creative writing, visual arts and, the core component, movement. The program, which operates in Tampa-St. Petersburg, Broward and Ocala as well as in Miami-Dade and which reaches 600 women in prison and girls in juvenile detention each year, is based on the belief that the arts can transform individuals and strengthen communities. “Movement is key especially in the beginning,” says Leslie Neal, a former dancer who developed the program in 1994 and still directs it. The women, almost all of whom have suffered physical or sexual abuse, come into the program self-conscious. Their self-expression has been stifled. They have locked away their feelings as a way of surviving, and movement helps them to open up. Early on, Leslie has the women walking around the room. Initially they are cautious, often walking in a circle like cattle. She encourages them to take individual pathways, to slow down or speed up. Gradually they begin to loosen up. Sometimes they start to skip and play, almost as though recapturing the freedom of childhood. They notice their breath and their heart beat. They begin to open up. They become more vulnerable. They become more aware of who they are. Leslie has them examine their walk very carefully. What is unique about your individual walk, she asks. What happens to your body if you walk on your heels? On the sides of your feet? Reflection is an important companion component. At the end of each exercise, the women explore how they felt during it, what they learned from it. From this early walking exercise, the women discover that if they change their walk a little bit, the rest of the body adjusts in response. As they continue to walk and talk and explore, walking becomes a metaphor: If you make one big mistake in life, others are likely to follow. From this observation comes a homework assignment: How has this metaphor operated in your life? Perhaps you hung out with the wrong guy. He got you into drugs, and that’s how you became engaged in crime. “There is always one class that is epiphanous,” Leslie says. Sometimes it’s something that a participant has written or a story she has told that strikes a chord with the others, and they realize they are not alone. Perhaps one woman says, “In this exercise I was reminded of my childhood. My mother was never there for me.” And all of a sudden, other participants’ experiences begin to emerge. The approach is therapeutic. When a participant shares her work, only positive feedback is allowed. The women are protected from the kind of criticism that rips people and their work apart. As a result, trust and safety are reinforced, self-esteem grows. At the same time, ArtSpring teaches its participants to look honestly at themselves and recognize how they have to change their behavior to succeed in society. It teaches them that they are deserving, that they have a sense of self, that they are cared for, that they are valuable human beings who have something valuable to give to the world. So when they are hit with a lot of stress, they can hold on to these concepts. In addition, ArtSpring teaches personal responsibility. The program is voluntary, but women who sign up are required to commit to the class. They must attend, do the work of self exploration, look within and discover their dark places, and then share those with others. For many of the women, this is the first time they’ve committed to anything. By providing individuality and humanity in the prison environment, which seeks to obliterate those qualities, ArtSpring is a lifeline to the inmates. As another offender put it, ArtSpring enables them to feel free even though they are in prison. Understandably, once they have experienced the program, they don’t want to quit. So over the years, the faculty has devised several follow-up courses in specific disciplines. A singer songwriter teaches a music class. There are classes in visual arts and creative writing. A Midsummer Night’s Dream was the culmination of the advanced theater course – two hours a week for 25 weeks. The value of the ArtSpring experience quickly became apparent during a talkback after the performance. The cast recounted how the prisoner playing Puck was put in lock-up just days before the performance, and the cast worried she would not be released. How would they cover this key role? They decided to divide her part among all of them and make a Puck mask that each substitute would wear so that the audience could keep track. This kind of teamwork would ordinarily be unheard of. To illustrate the enormity of what ArtSpring accomplishes, Leslie tells of a former offender who appeared so developmentally delayed that she would not be able to manage the class. To everyone’s surprise, she blossomed as she gained confidence in class. Now living in New England, this young woman is happy and gainfully employed. She insists she would not have been able to achieve this success without the class. The women who participate in ArtSpring use what they learn in class when they talk with their children and other loved ones, and so the program has a positive impact the participants’ families and communities. And when the staff sees the change in the women, especially in the context of their theater performance, the warden and guards alter the way they relate to the women. Thus, ArtSpring, in a very small way, is changing the system. Most impressive is the recidivism rate among those who have participated in ArtSpring classes for at least a year. Whereas the typical rate of recidivism is 60% after 2 years, among ArtSpring participants it is zero. ArtSpring operates with an administrative staff of three: a full time executive director and an administrative assistant, who is an ex-offender, in addition to Leslie. The Miami-Dade program also includes seven artist teachers. The $250,000 annual budget is derived from public funding, private foundation grants, corporate and private donations, and support of the Seminole Indians. Finding additional resources is their biggest challenge. With more money and more teachers, they could provide additional classes and reach more women. This entry was posted in Spotlight On by culturebuildsflorida. Bookmark the permalink.